Fancy a little local flavour-packed favourite? Who doesn't love a samoosa or three!? 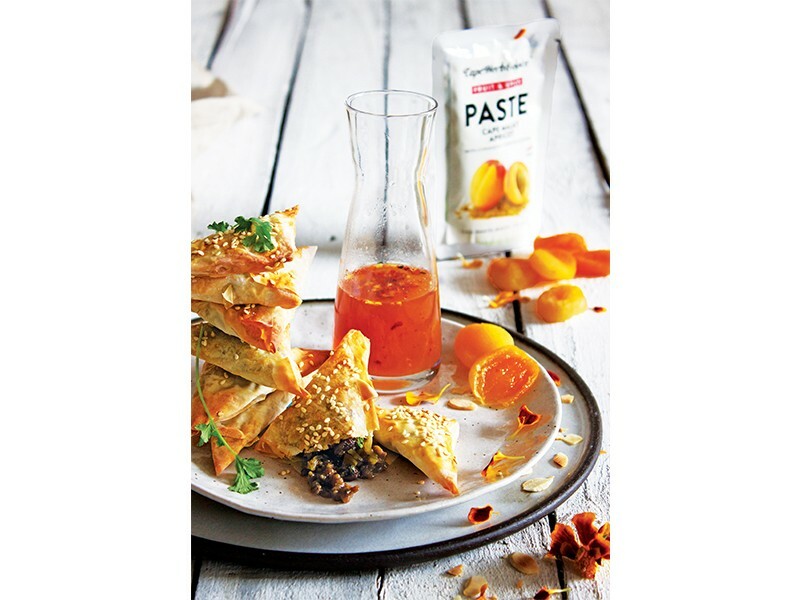 Here's a version that adds an element of posh, without the fuss, through the use of the gorgeously versatile Cape Herb & Spice Cape Malay Apricot Paste (see other flavours in this innovative range on the website) together with phyllo pastry. In our attempts to stick to New Years resultions, we have opted for a 'baked' method - however, if frying is your fancy - go right ahead! Fry the onion in oil until soft and caramelised. Add the beef and fry on high until it starts to brown. Add the Cape Herb & Spice Cape Malay Apricot Paste, water, raisins and salt. Cook until done and most of the water has evaporated. Allow to cool. Add the almonds to the meat. Cut the phyllo pastry in long strips 4cm wide and paint lightly with melted butter. Place a heaped tablespoon of the mince filling in one corner of a pastry strip and fold it over again and again to form a triangle. Repeat until all the mince is used. Place on a non-stick baking tray and bake at 200 ˚C until golden brown (alternatively, deep fry if preferred). Serve right away while warm together with the dipping sauce. To make the dipping sauce, melt apricot jam with a few tablespoons water, a squeeze of lemon and a pinch of chilli flakes.